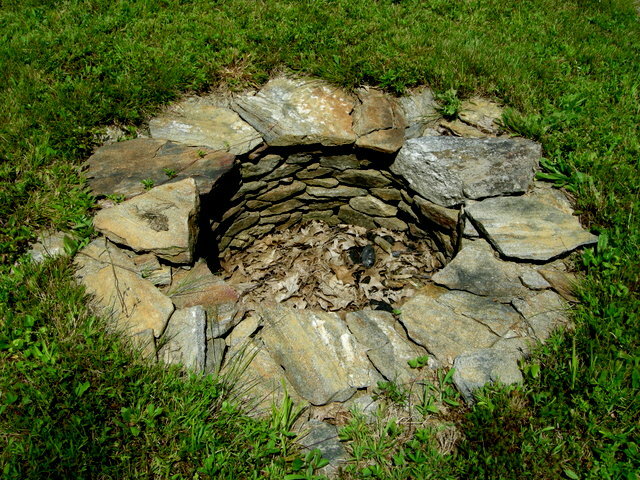 One of the gardens on the tour surrounded this classic New England cape. 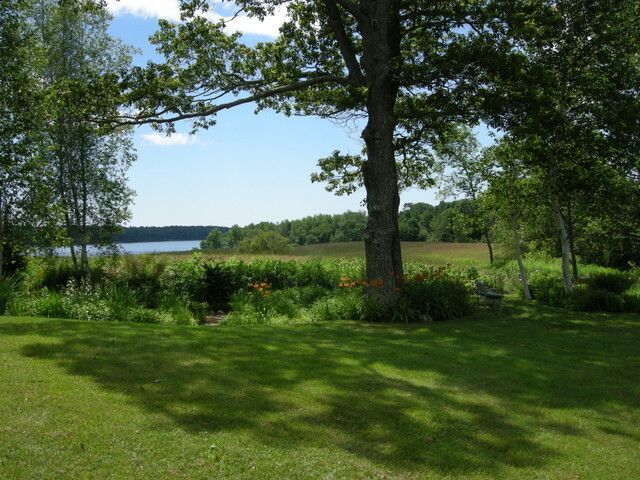 Earlier this month, I attended the 2013 Brunswick (Maine) Garden tour with fellow blogger Jean from Jean’s Garden. 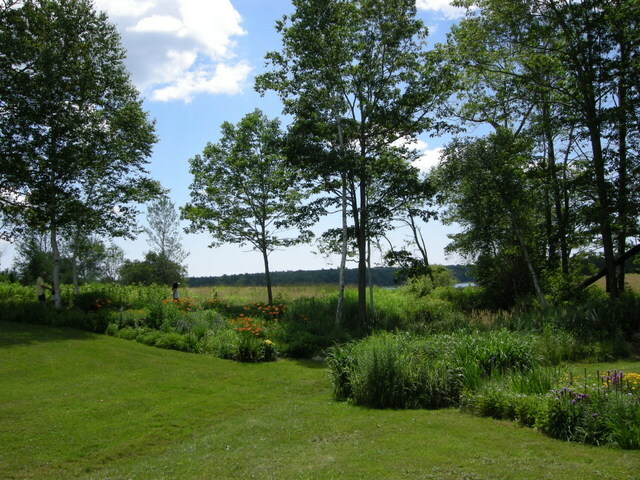 We both spend parts of our summers in Maine, and this is the third summer that we have gotten together for a garden related event. The tour benefited the Mid Coast Hunger Prevention Program. The MCHPP runs the Brunswick soup kitchen, food pantry, and food bank as well as providing services for homebound clients and offering a summer feeding program. 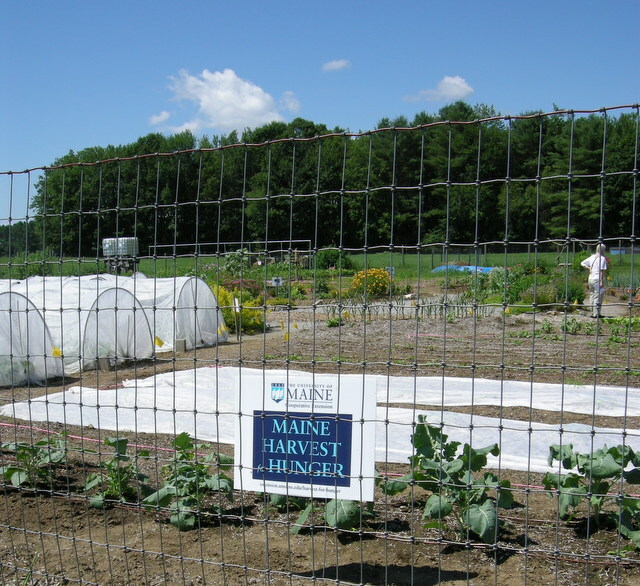 It benefits over 1,200 families in need in the Mid Coast Maine area.
. One of the gardens on the tour was the Tom Settlemire Community Garden, a large part of which provides vegetables for the MCHPP.
. 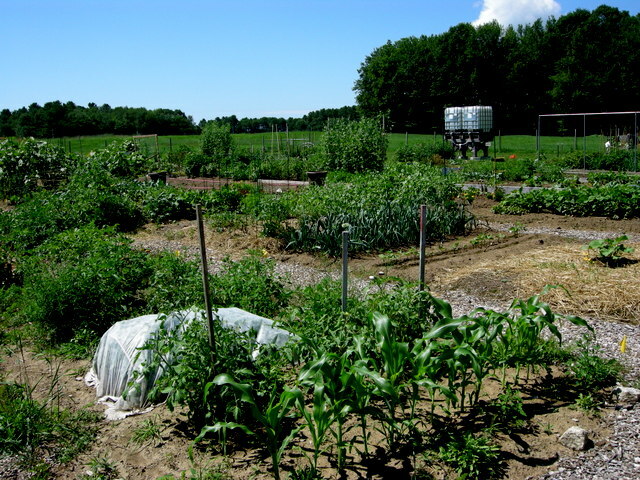 The area that grows food for the MCHPP is called the “Common Good” bed and is very neat and organized. 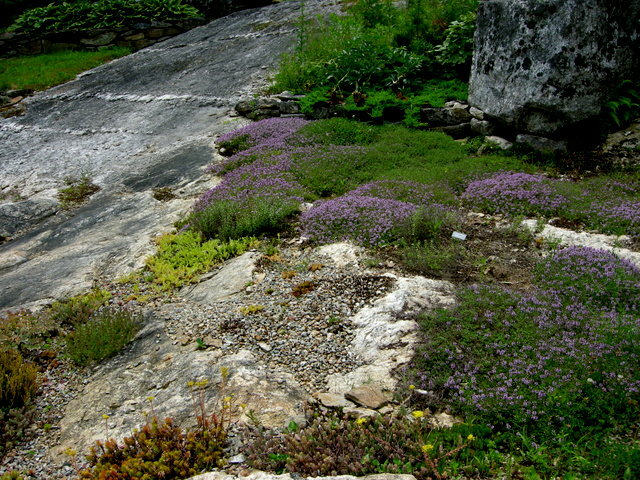 The tour included nine gardens. Although none of them were spectacular, they all had interesting elements and plants worth photographing. It was one of the days when it was 90 degrees in Maine with very bright sunshine which is not great for photography (or for people to be outside for that matter), but we persevered. It was fun spending the day with Jean and driving around beautiful Brunswick and its environs. I graduated from Bowdoin College, which is located in Brunswick, so I was also reliving my youth. 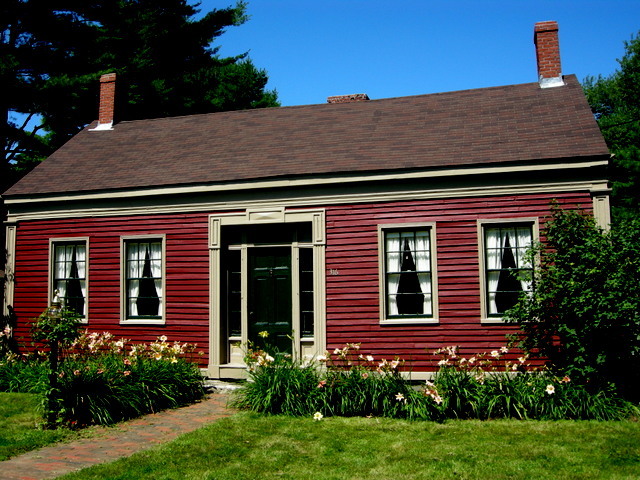 The first two houses on the tour belong to Bowdoin College. 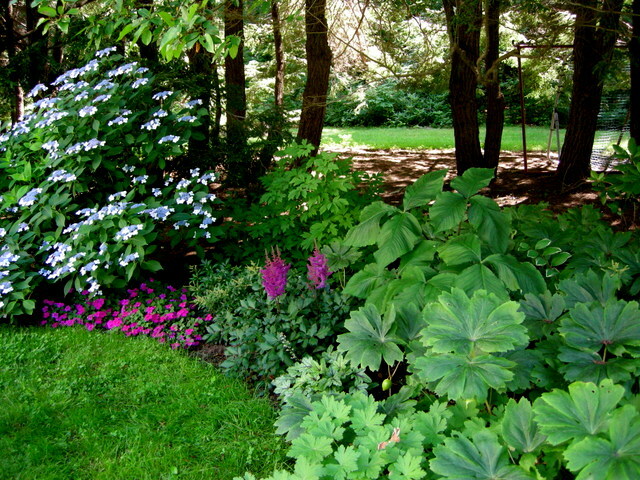 Behind one is this creative combination of traditional native plants like mayapples and jack-in-the-pulpits with hydrangeas and astilbes. The highlight of the day for me was our afternoon visit to the Bowdoin College Museum of Art. We went to see the current exhibit called Maurice Prendergast: By the Sea. It features a truly spectacular assembly, filling three entire galleries, of the seaside paintings of American Post Impressionist painter Maurice Prendergast (1858 to 1924). The works, many of which were painted in Maine, span Prendergast’s career and illustrate beautifully how he progressed and changed as a painter and what events and people influenced his style. This excellent show will continue at the museum through October 13. 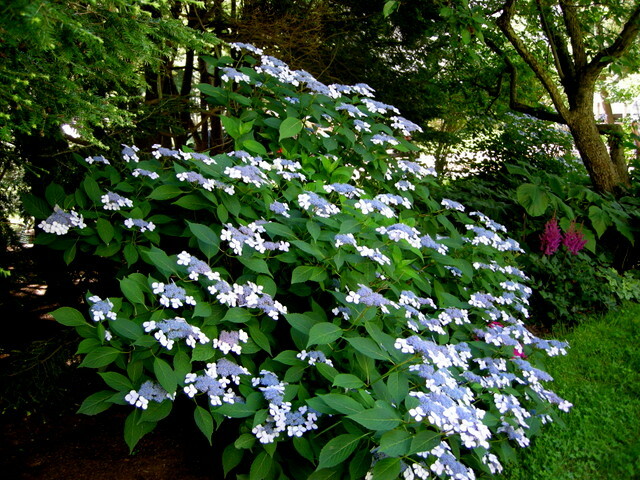 Hydrangeas grow so beautifully in Maine. 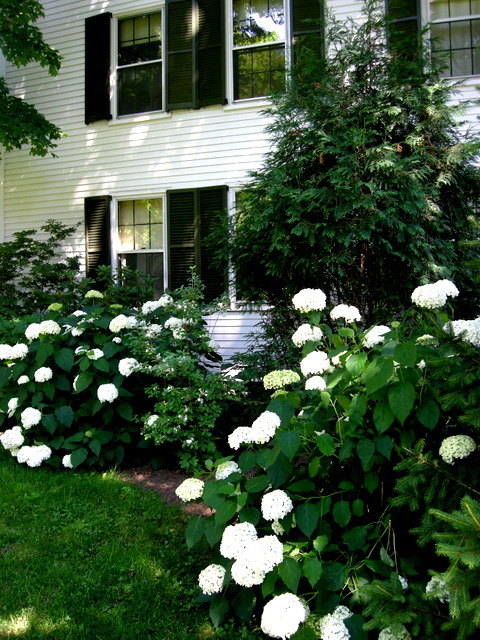 Although white on white doesn’t always work, these hydrangeas look gorgeous in front of the home of the President of Bowdoin College. 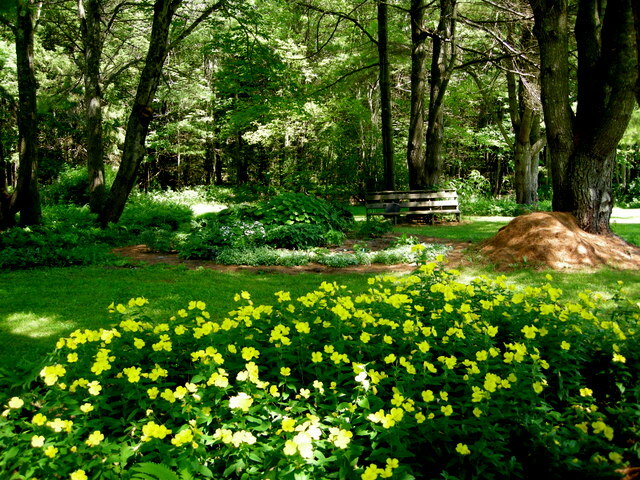 This home has a lovely shade garden fronted by sundrops or evening primroses. 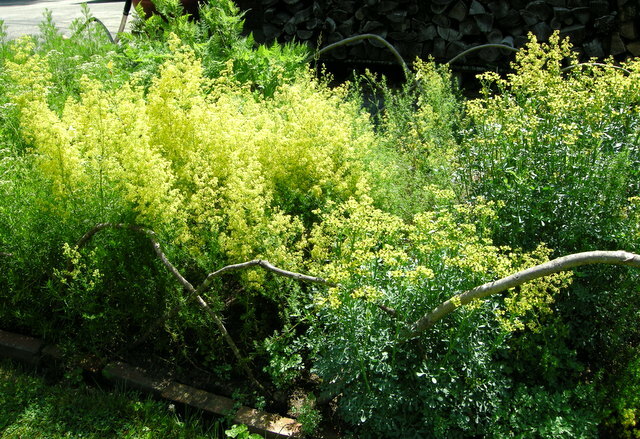 The sunlight shining through the common rue on the right and the complimentary (but unknown to me) plant on the left was a beautiful effect. 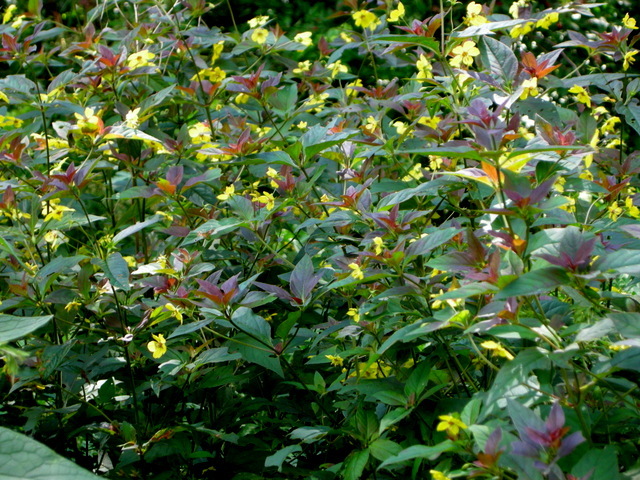 Fringed loosestrife, Lysimachia ciliata, is native to almost every state in the U.S. and much of Canada, but I have never seen it before. A large stand of it is quite pretty. 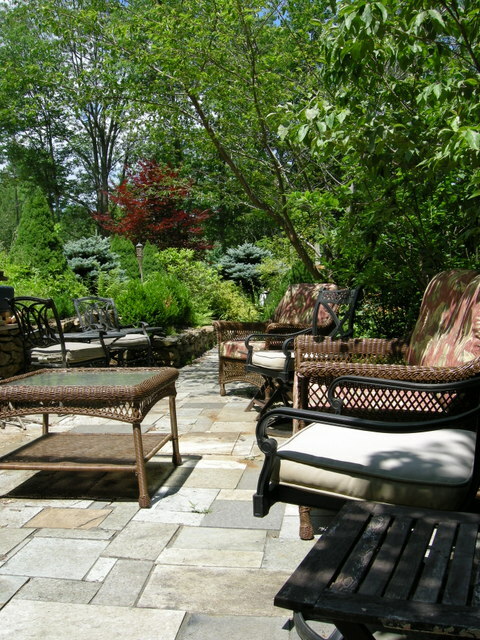 This garden has beautiful views of Maquoit Bay over expansive perennial beds. 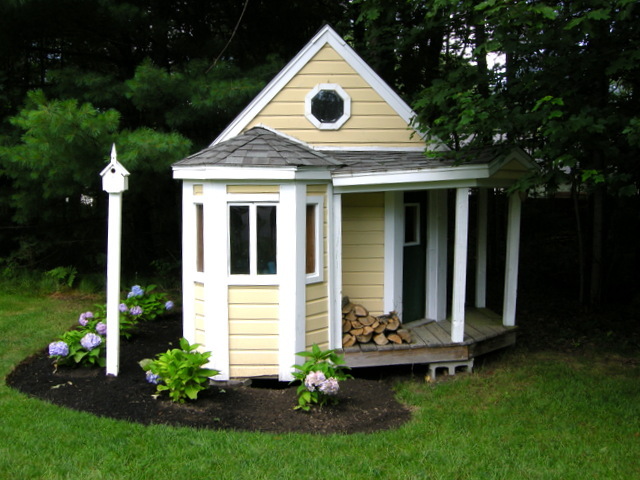 I can see myself sitting in this charming little playhouse retreat working on the gardening book I have always wanted to write. Seating area at Sky Hy. 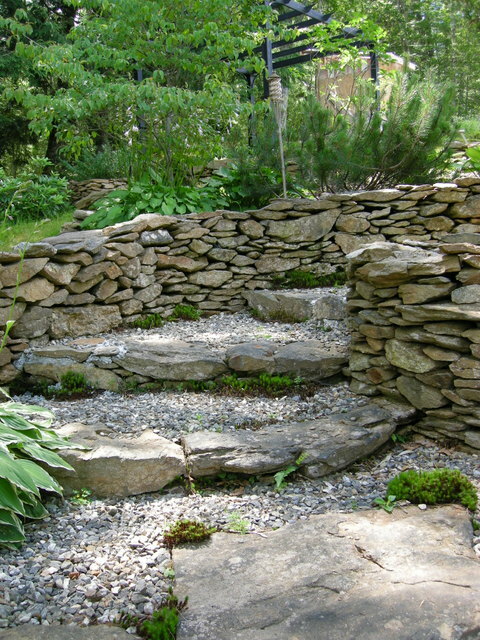 Paths lead between all the levels and are enclosed by beautiful stone walls. 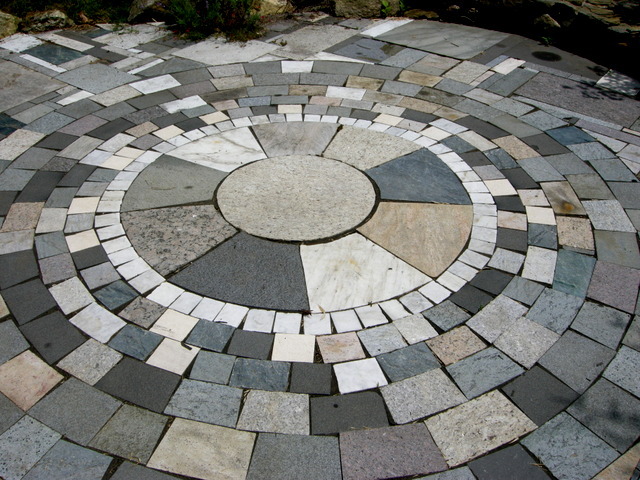 Stone floor of one of the party areas. 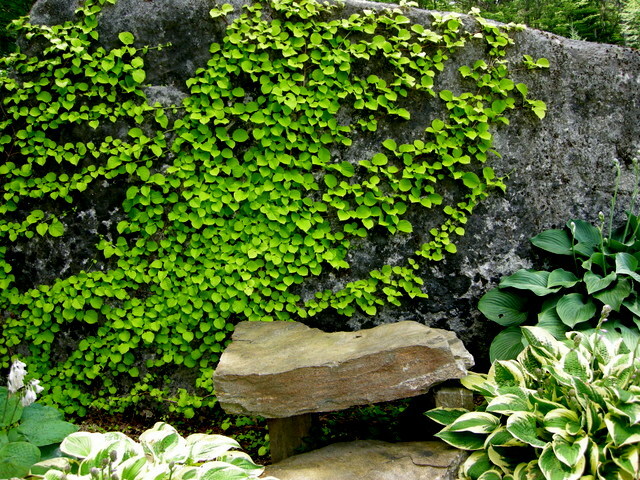 Exposed ledge with lovely complimentary plantings.